Join us on Thursday, February 21st, 2019 for our 44th annual conservation banquet! Funds raised stay in our local area for trout habitat improvement and youth outdoor education. 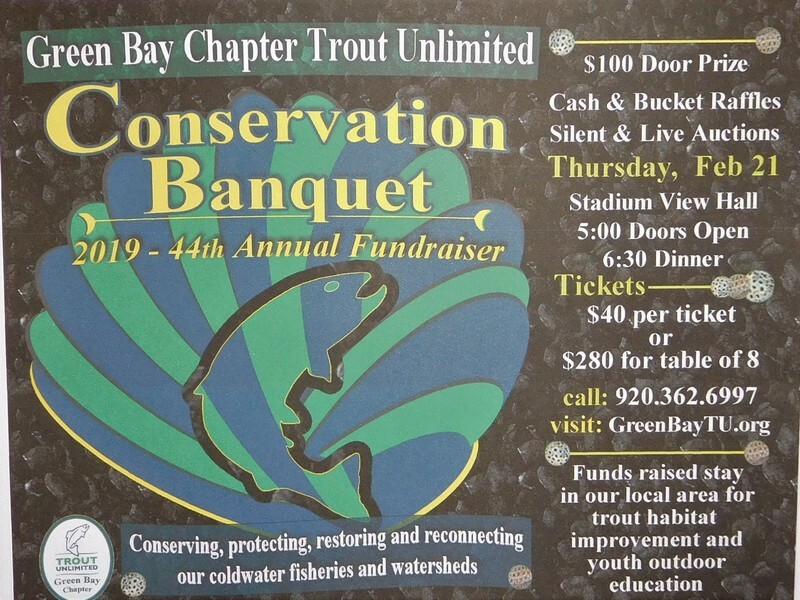 Help GBTU accomplish our mission to conserve, protect, restore, and reconnect our communities and the cold water resources throughout northeastern Wisconsin. This year’s event will be another fun-filled evening. We will have an excellent dinner and incredible prizes. Our banquet features door prizes, 50/50 raffle, bucket raffle, silent auction, live auction and much more. CLICK HERE to find a list of this year’s live auction items. Any questions about ticket information or other sponsorship opportunities, please call Dave Ostanek at 920.362.6997. Ticket will be available during our February 7th meeting at Townline Bar and Grill. More information on this meeting can be found on our website. Tickets are also going to be available for purchase at Stadium View the night of the banquet. All donations plus Bronze, Silver, Gold and Platinum sponsors are recognized on our banquet program, placemat, and website. Thanks for all that you do for the cold water resource ! !